Sherburn was born into considerable wealth. (His father, Washington “Lace Curtain” Becker – so called for his prominent white whiskers – was president of Marine National Bank.) Sherburn developed an early interest in firefighting and even had a fire department alarm indicator installed in his bedroom in the family house at 1409 N. Prospect Ave. When the alarm sounded, Sherburn was off and running. On cold days he would take along containers of hot coffee to serve to the chilled firefighters. 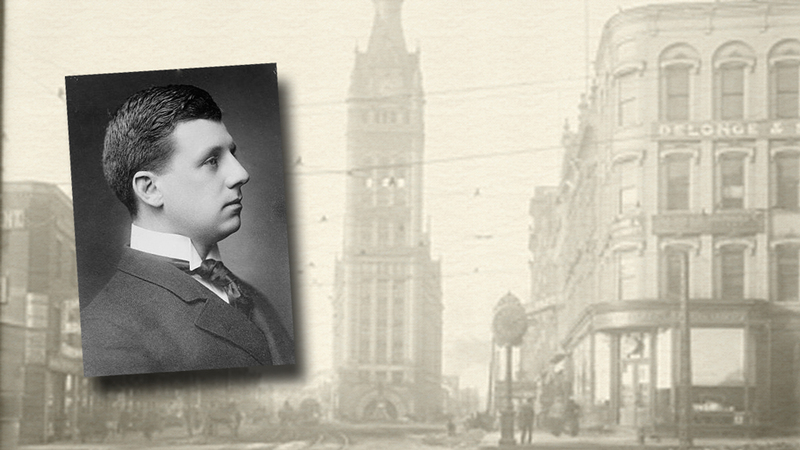 Although Sherburn had already served terms as 1st Ward Alderman and as a County Supervisor, Milwaukee’s political insiders laughed when Sherburn announced he would run for mayor. After all, the 26-year-old was facing incumbent David S. Rose, a popular and politically powerful mayor seeking his fifth consecutive term in office. From that point on, whenever Rose would give a speech, someone in the crowd was certain to bellow “tin horn!” to the general laughter of the audience. On election day, Sherburn won by a comfortable margin and embarked on a two-year term best described as “uproarious.” Sherburn, after first ordering a fire alarm indicator installed in the mayor’s office, hit the ground running. On the heels of his upset election, he was invited to give a speech in New York City. Rather than take the train, Sherburn, three friends, and a chauffeur crowded into his bright red Pope-Toledo automobile and set off cross-country. This at a time when most roads were little more than primitive dirt tracks. The mayor, whose car was decorated with a banner reading “Sherburn M. Becker, Boy Mayor of Milwaukee,” stopped at towns along the way to give speeches. A favorite topic was the need to improve roads. By the time they reached Toledo, the car was on its last legs and was handed over to the Pope-Toledo company to be rebuilt. It is said factory personnel replaced nearly everything but the engine but soon had the car back on the road to New York. The party, having driven around a policeman in Erie, Pa., who was attempting to arrest them for violating that city’s ban on automobiles, arrived in New York City in 62 hours, easily setting a long-distance driving record. After delivering his speech, Becker paid a call on President Theodore Roosevelt at his home at Oyster Bay, New York. Roosevelt had forbade the use of automobiles on his estate, but set the rule aside temporarily so that Sherburn and his famous red car could roar triumphantly up to the front door. Back in Milwaukee, the mayor made headlines with another spectacular stunt. Jewelers, at the time, customarily advertised their businesses with large post-mounted sidewalk clocks. In 1906, there were a great many jewelers along Grand Avenue (now Wisconsin Avenue) and consequently a great many clocks cemented into city sidewalks. The road trip and the midnight removal of sidewalk clocks are the main things for which Becker is remembered but he did much else in his two years in office. From his hobby interest in firefighting, he was aware that advertising signs overhanging sidewalks dangerously impeded firefighters and complicated rescue efforts. There were many of these signs in Milwaukee but the mayor and fire department quietly and successfully worked with building owners to have them removed. In early 1908, a fire in a public school in North Collinwood, Ohio, a suburb of Cleveland, took the lives of 174 children and two teachers. Most of the bodies were found huddled against a poorly designed exit door. The mayor and members of the Milwaukee School Board determined nothing of the sort would happen here, and soon had every school in the city equipped with vastly improved fire escapes. Sherburn did not seek reelection in 1908 and David Rose finally won his fifth term. The former boy mayor purchased a seat on the New York Stock Exchange and settled into a successful financial career. In 1937, he retired to a 2,000-acre dairy farm in upstate New York. In April 1946, Becker visited the city to attend a Marine Bank shareholders meeting and sat down for an interview with The Milwaukee Journal. “We have to stay young in our ideas,” the 69-year-old Becker told the paper. He died in 1949 at the age of 72, and is buried in Milwaukee’s Forest Home Cemetery. Thanks, Carl for another fascinating report. Sorry, wearing a brace that clicks things! My comments were that it took until the end of the article to find out the time period to which you were referring. I like to put things into context, and assume that others do as well. The other is that your links lead to dead ends. I really enjoy reading your posts, and have shared then with others. Keep it up! Excellent point about the time frame, I’ve modified the post to note in the opening paragraph he was elected in 1906. I’ll have look into the broken links issue — I’m not sure what I’m doing wrong there. I really appreciate your interest in the blog! I now have the desire to shout “tin horn!” the next time I end up witnessing someone make a speech…I think that kind of thing was more accepted in those days!